Our school is an Eco-School. We are very proud to have gained the Eco-Schools Silver Award for our hard work in school. 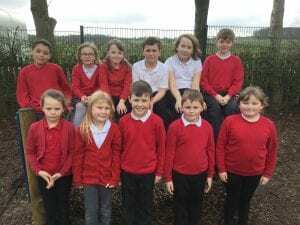 Our Eco group, which we have named ‘Eco Warriors’, is run by twelve KS1 and 2 pupils. We have had an Eco group for the past 5 years. We work extremely hard in school to improve our school grounds and we also take part in the Walk Once a Week project (WoW). We meet once every half term to look at ways to improve our school and discuss any ways we can make our school more eco-friendly, such as: monitoring any litter on our school yard, meeting with Mrs McNamara (our cook) to learn about food waste, discussing our carbon footprint with Mr Gregory (our caretaker) to help us investigate how much energy and water we use and we are also going to be setting up our own ‘litter patrols’ to monitor the tidiness of our classrooms. Make scarecrows to protect our plants. So far this year we have enjoyed learning about food waste and how we can help minimise this waste.